"My dear children, in the Peace and Love of my Son, Jesus, I greet you. "My heart is joyful to see you gathered together in prayer. Pray always. Be united as you are today. "Do not be sad. I do not leave you. I remain with you. "My Son desires your heart; please give it to Him. "My children, you have the Rosary. Pray the Rosary each day. "Accept the Scapular as a sign of devotion and consecration to my Immaculate Heart. Consecrate your families and your children to me. "The refuge that you seek is in my heart. I will take you to the Heart of my Son. "My children, for several years I have come among you in a special way. "The time has come for you to walk in faith. Begin by examining your life. Seek frequent reconciliation with God. "Children, pray for each other. Help each other. "There is sadness in my heart that my messages have not been received by many. Many of my children are lost; please children, pray for them. "The purpose of my coming is to bring you to my Son. "Children, my Son has given you the Living Bread. He is the Living Bread come down from Heaven. Partake of Him with utmost purity and respect. Please do not reject my Son. He has given you everything. "Difficult days are ahead for you. Repent, repent, repent. Please amend your ways. 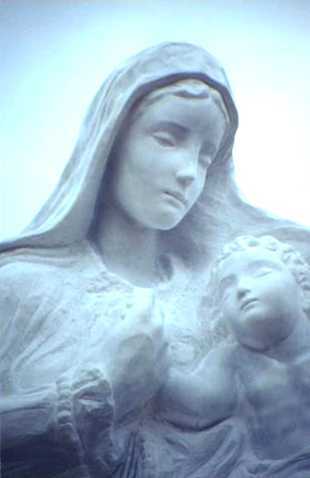 "I am the Loving Mother of God and I am [she paused] your Loving Mother. A mother has a child and I have given you my Child. I ask you to give of yourselves and begin to live the Life of my Son. My Son is being rejected by His children everywhere." [A map of the world appeared in red.] "I ask you to open your hearts and let Him live in you. "Thank you for responding to our invitations of Love. "With our hearts joined, let us walk behind my Son. The time has come now for you to live the messages and to walk in faith. "I am giving you a special blessing now which you can extend to each other in Love. I will bless everything you have with you. "In the Peace and Love of my Son, I leave you, yet I remain with you."